I have always hated housework. I know what you’re thinking….doesn’t everyone? But no, not everyone does. Some people feel a sense of accomplishment. Some people get into the Zen of it. Me? I just plain hate it. See, at Blogher, I stopped by the Quickie Booth and took some sort of “how messy are you?” quiz. (I say “some sort of quiz” because I have no recollection of taking said test. Must have been the sponsor-floor induced stupor I was in!) 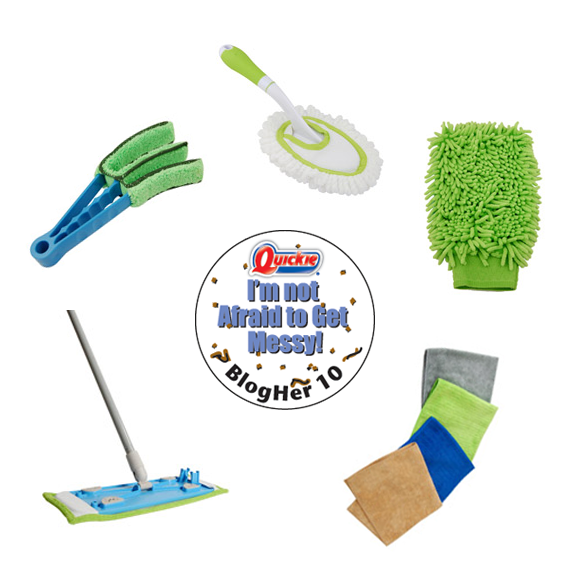 In any case, turns out I’m pretty seriously messy, because my answers won me the dubious distinction of being named a Quickie Messiest Blogger, and a prize: a micro-fiber cleaning kit from Quickie. Then, at the Mouthy Housewives party, the kind folks from LG, who had evidently lost their minds, gave everyone there a free vacuum. Seriously. And not just any vacuum. A $419 LG Kompressor Plus, the vacuum that picks up more and lets you empty less. 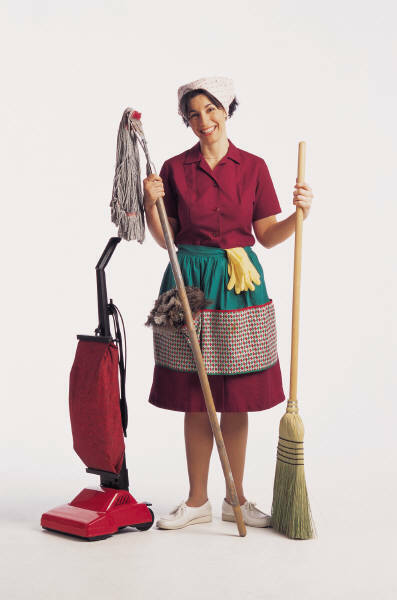 So you see – between Quickie and LG….well, the housewifely gods are telling me something: Thou Must Clean. I don’t like to clean – but I do like it when things ARE clean. So I was curious to see if the things really worked. They do. My stainless steel backsplash is shiny and bright – using only a microfiber cloth from my multi-surface microfiber cloth multi-pack (no harsh chemicals or abrasive scrubs), not a lot of elbow grease, and some water. Turns out my Quickie Floor Mop (which joins my multitudinous and much-loved (but chemical using) Swiffer mops) does a great job on my beautiful herringbone floors all by itself. Using the chenille dusting mitt is less like dusting and more like feeling up the stuff in your house. You just stick it on your hand and then rub stuff! I also got a weirdly massive bathroom scrubber sponge (though I think I’ll still use it with a cleaning product in the bathroom), a microfiber duster, and a nifty little blind cleaner wand. See, they have me using words like “nifty” when I’m talking about cleaning. Also – it all makes me think: there used to be a time when cleaning supplies meant a broom, a mop, a bottle of ammonia and some rags. Ah, the old days! My LG Kompressor arrived this morning. 6:30 this morning….but never mind. The thing is very impressive. Lots of accessories: a pet hair tool, a crevice tool, a dusting tool, a wand attachment, and a lovely brown leather belt with metallic mesh accent…oh, wait – that’s an accessory I got at Loehmanns. It’s very fancy. (the vacuum – not the belt.) Good thing it looks good, too, since I have no idea where I’m going to put it. (There’s a reason apartment dwellers have canister vacuums — they fit under the coats in your closet.) I may end up having to have it on permanent display in my living room. Looks, like my mother likes to tell me, aren’t everything. So it’s good that the LG Kompressor is quite the powerful vacuum. With some very nifty (there’s that word again) features. Like the compressor in the canister which means you have to empty your vacuum less and there will be less mess when you do it. See, the dust is all packed in (compressed! ), so it doesn’t all escape when you open up the canister. It has a super long (40 foot) cord, for less plugging and unplugging, and most importantly — this thing has SUCTION. As a matter of fact (and I’m sure this is NOT the type of thing the LG people wanna hear) the thing is so loud and powerful, that my dog FREAKED. While I was testing it out, he barked like crazy, ran out of the room, and made a smelly mess on the floor. Yes, it’s true, the thing literally scared the crap out of my dog. Which only means one thing. I’ll have to get out the Quickie cleaning tools again. Fine Print/Full Disclosure: In case this post wasn’t clear enough, I won all of the Quickie Products for being an incredible mess. (and thus got them for free). And I was given the Vacuum as a gift – with no personal contact on my part with the company at all – simply for being lucky enough to be at the Mouthy Housewives Blogher Party. I have lived in my house for 15 years. The 1st 10 we had a Rainbow Vacuum system- loved it until it died. 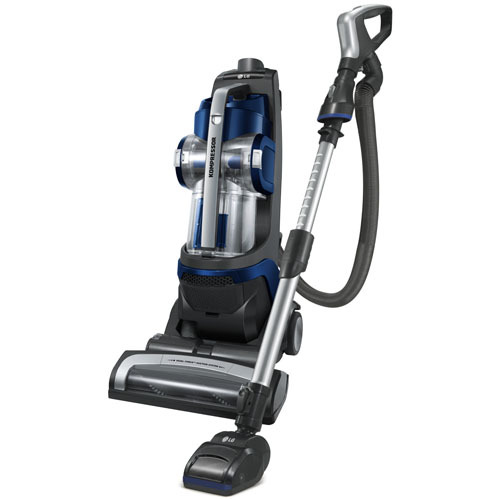 In the last 5 years we have gone thru 4 vacuums… and some of them were not cheap!!! Have also been thru 2 Floormates, 2 Rug shampoo/steamers, and 2 little Green Machines. As you can see, I am heck on cleaning items. Did I mention I have vacuum envy? Seriously. Let me know how that vacuum works, holds up, cleans up, and how much upkeep it needs to work optimally. Oh, can it clean carpet, hardwood and tile floors without issue? You got yourself a nice vacuum there. Have you ever seen a backpack vacuum? They are cool too. They have some at abcvacuumwarehouse. This made me laugh, because I think that if I had been there, I might have given you a run for your money 😉 I am SERIOUSLY messy. I mean really really messy. But I do love microfiber for cleaning, because I am also allergic to synthetic fragrance so conventional cleaning products are a no-no for me! Just so you are aware, while reading your descriptions of the products, the way you have written this makes it sound less like you won some stuff you happen to like, and more like you’re somehow being compensated for acting like you like them, or overacting how *much* you like them. Just my opinion. And I’m not trying to make you feel bad for it or anything because I don’t even care if you were. Just it seems like that’s not the case nor the impression you want to make, so I thought I would point it out. Point taken. Though having a vacuum scare the crap out of my dog hardly constitutes an endorsement! Still. compensation is a big issue right now, and I appreciate the heads up. I will make sure to tell the good and the bad of any product I receive. I did not read this post because from your blog’s title I knew it would be whiny and poorly written. Just thought you would like to know. Why, thanks so much for letting me know! Always nice to have a kind word.